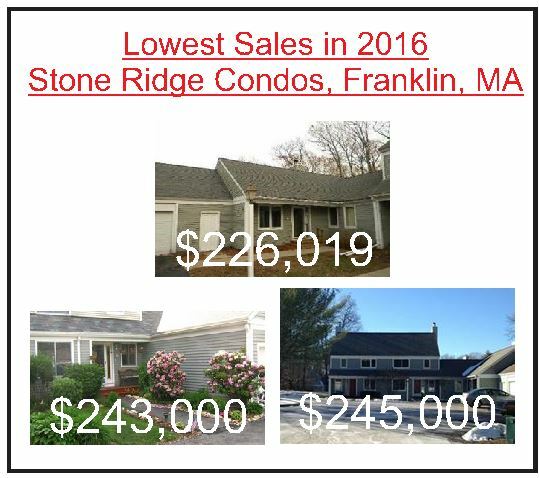 The average sale price for townhomes at the Stone Ridge condominiums in Franklin, MA rose a sizable 4.6% in 2016. 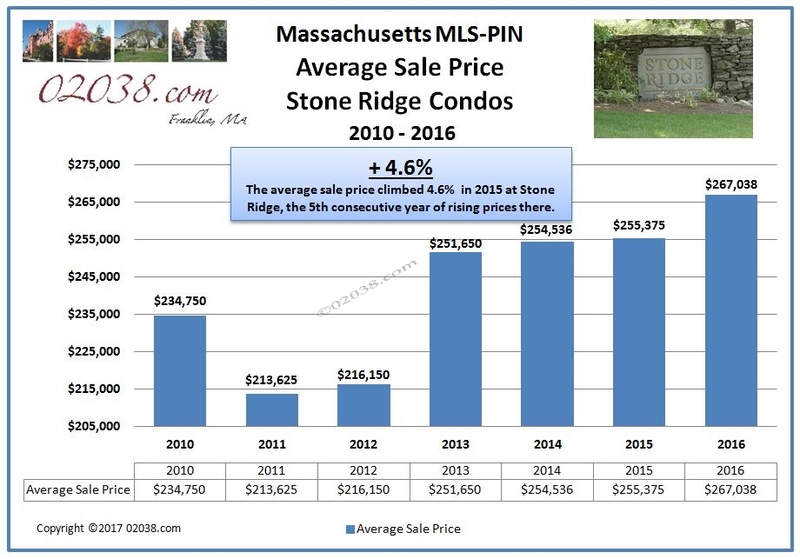 The average sale price of Stone Ridge condos now stands 25% above where it was in 2011. 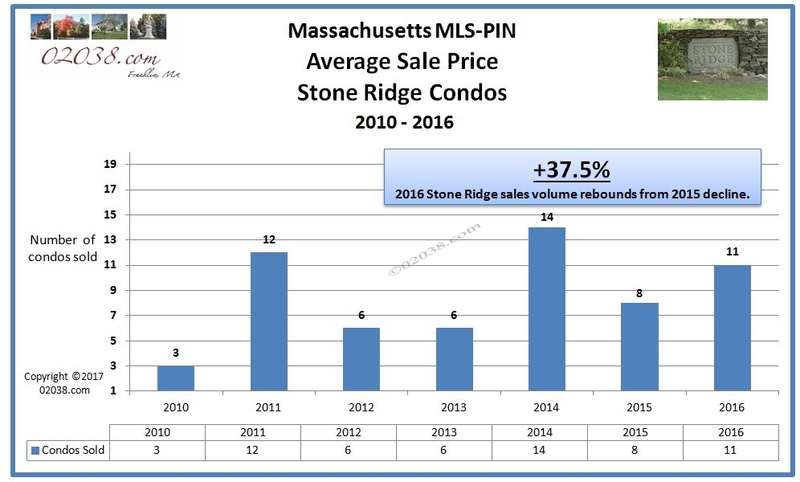 According to data maintained by MLS-PIN, the largest MLS in Massachusetts, 2016 was the fifth year in a row for price gains at Stone Ridge. Eleven Stone Ridge condos changed hands in 2016. That’s a 37.5% increase over the eight units that sold in 2015. 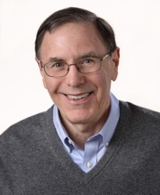 Although less than the fourteen units that sold in 2014, 2016’s sales volume at Stone Ridge exceeds annual totals for most of the years since the 2009 – 2010 financial crisis. The three Stone Ridge condos that sold for the highest prices of the year all offered a first floor bedroom and full bath, features that are in great demand in today’s market given the strong interest in one level living among older buyers. 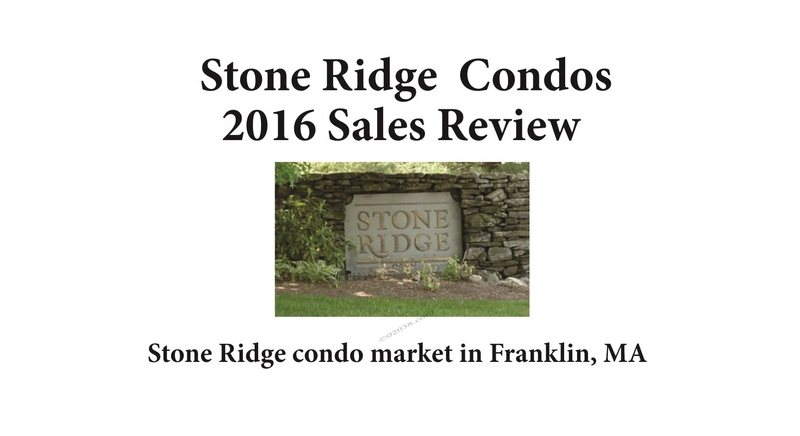 Follow the hotlink in this sentence or in the image above to download photos and details on the top three condo sales at Stone Ridge in Franklin, MA during 2016. 1 Stone Ridge Road sold in June 2016 for $326,500, over its $324,900 asking price. It had a total of three bedrooms (one on the first floor) and two and one half baths. The unit had been heavily modified: what had been the attic had been opened up and turned into a master suite. The kitchen and baths had received extensive updates. The huge tile shower was a standout feature! 106 Stone Ridge Road was a successful flip of a unit that received a new kitchen and baths, new hardwood floors and carpet and fresh paint. It sold for the $319,000 asking price in June 2016. The third highest sale price for the year was achieved by 49 Stone Ridge Road. It was a ranch style end units offering 2 bedrooms and 2 full baths on the first floor, with additional finished space In the basement. The kitchen and baths had been recently renovated and interior cosmetics were good. With a selling price of $226,019, 155 Stone Ridge fetched the lowest sale price during 2016. It was a bank owned unit that needed a lot of upgrades and repairs. 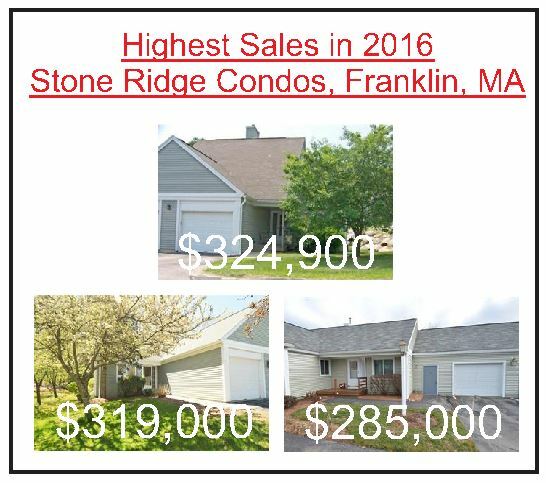 Follow the hotlink in this sentence or in the image above to download photos and details on the three lowest sales during 2016 at the Stone Ridge condominiums in Franklin MA. The other two lowest sale prices at Stone Ridge for the year both were for smaller units with all bedrooms on the second floor and unfinished basements. Stone Ridge is one of the best condo communities in Franklin, Massachusetts that are not age restricted. Anyone of any age can live there! All homes at Stone Ridge come with gas heat and central air. Each unit has a full basement and garage parking. Stone Ridge enjoys a prime location in Franklin, MA near I-495, the Forge Hill commuter rail station and plentiful shopping. Contact Warren Reynolds for more information on Stone Ridge and to get inside all homes for sale there!